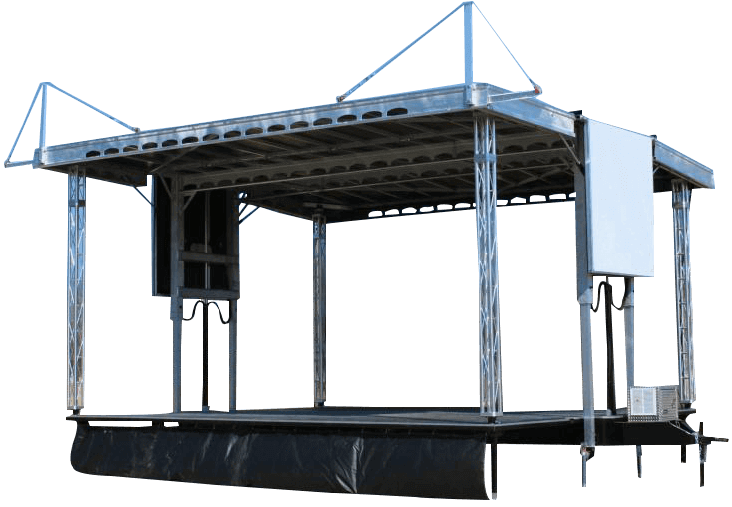 Featuring a 24′ x 20′ stage deck an additional 13′ of stage height and the availability to be towed with a gooseneck by a one ton truck, this is the “little brother” to our popular APEX 3224. It is the perfect stage for smaller venue professional productions. The flybys can hold an impressive 2,000 lbs each and an additional 4,000 lbs of cargo can be secured and hauled inside the enclosed trailer. The APEX 2420 is equipped with steel wheels, hydraulic outriggers, all aluminum construction trailer frame, two single axels, and a gas powered motor. The stage deck uses the same custom floor extrusion as the 3224 to make adding additional decks seamless and easy. The handrail system is compatible and interchangeable with the 3224 stage.